Here is a photo of my first pinkeep. I very happy with the result ...now I want to have a collection of them hehe! Les muesto mi primer "pinkeep" terminado. Me gusta mucho como ha quedado, y tanto así que ahora quiero tener una colección de ellos. My dad went on a business trip to Houston a couple a weeks ago, and he brought me two kit by Dimensions...Teddy Bear Gathering and The Guardians. He wants me to stitch The Guardians for him, he's moving in a few months to his new apartment and wants to have this piece displayed in one of its walls. Mi papá estuvo en Houston hace un par de semanas por motivos de trabajo y entre las cositas que me trajo de su viaje, incluyo estos dos kits de Dimensions. El de los lobos que se llama "The Guardians", lo quiere para él; dentro de pocos meses se va a mudar a su nuevo departamento y lo quiere para decorar una de sus paredes. I have a new HD to share !! 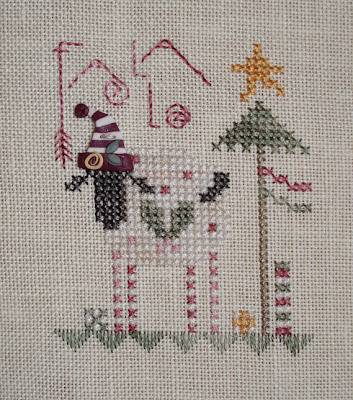 As most of you know, this is a design by LHN & CCN called "Bee Pinkeep" that came in the magazine The Gift of Stitching (Issue 12 - Jan. 2007). As soon as I got my mag and saw it I knew I had to stitch it. On Thursday two friends (both x-stitcher) and I are getting together to do some crafts, so that day I'll do the finishing and make my first ever pinkeep. Ayer termine de bordar este diseño !! Se llama "Bee Pinkeep" y vino en el número de enero de este año de la revista The Gift of Stitching. Desde que lo vi en la revista me gusto mucho y sabia que seria perfecto para poder hacer mi primer "pinkeep". El jueves dos amigas y yo nos vamos a reunir para hacer manualidades asi que aprovecharé para poder terminarlo ese día. After 9 hours of stitching, this is my progress on Baby's Friends, the piece I chose to work on during this weekend's Stitch-A-Thon. Eventhough I didn't finish all the x stitch as I wanted I think I made a good progress. Este es mi avance después de haber bordado 9 horas durante el fin de semana de la Stitch-A-Thon. No cumplí mi meta (jeje era un poco ilusa), pero creo que hice un buen progreso. This weekend is the Stitch-A-Thon at the Friends Gather BB, I'm going to work on Baby's Friends a birth announcement by Dimensions that I'm doing for my little nephew. 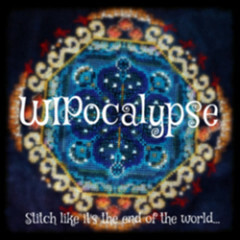 I want to finish all the "x" stitch, this weekend...we'll see how that goes, I think I' being a little bit optimistic . On Monday I'll post a before and after photo . 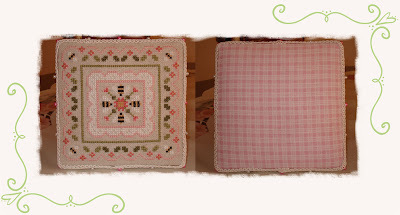 On the right you can see what I've been stitching this week, it's Bee Pinkeep by LHN & CCN. I've not finish it yet...I think I have an hour or two to work on it before it's done, but that will be on Monday. Este fin de semana es el Stitch-A-Thon en el foro Friends Gather BB, he decidido participar en él y trabajaré en el anuncio de nacimiento que estoy haciendo para mi sobrino, es un diseño de Dimension llamado Baby's Friends. Mi plan es terminar de bordar todas la cruces...vamos a ver como me va y a ver si lo consigo. La primera foto es lo que he estado bordando durante la semana, se llama Bee Pinkeep. Aún no lo he terminado, creo que me falta más o menos una hora o dos más de trabajo para poder finalizarlo, pero eso sera ya el lunes ya que quiero dedicarme al anuncio de nacimiento el fin de semana (el lunes publicare una foto de mi progreso en el Stitch-A-Thon). 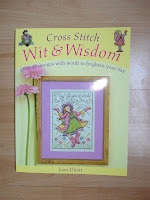 This week I bought the lastest book published of Joan Elliot's designs, "Wit & Wisdom". 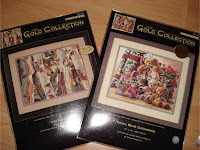 There are 45 very cute designs in it... I already made a list of the ones I want to stitch in the future . Esta semana recibí el último libro publicado con los diseños de Joan Elliot. Contiene 45 diseños para diferentes ocasiones, navidad, nacimientos, bodas, etc. Ya hice mi lista de las diseños que me gustaría bordar en un futuro. Do you like to buy "chartpacks" that include charms, buttons, and/or beads or do you prefer to gather all materials yourself? I definitively prefer "chartpacks", the main reasons is that in Peru is kind of difficult to find charms or buttons that I like. Hi!!! it's been a long time since my last post... just not enough time for stitching these days. But this past Saturday I decided to bring this small kit that Carla gave me as a gift to the office. I knew I was going to have a very slow day. It was finished in about 4hrs. It was my first time stitching with silks and now I can't wait to do another project with this kind of threads. On Friday I finished this piece , it took me 4 evenings to have it done. 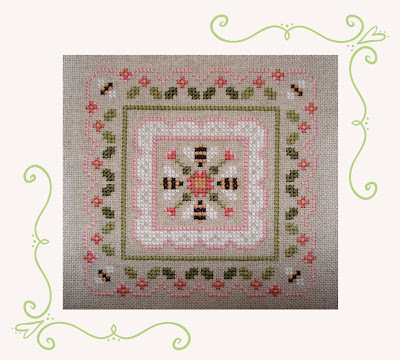 It's a freebie that I found on a French website, Anne le petit croix. 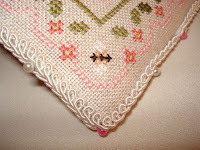 I love the colors used on this design and the fact that it was easy to stitch. 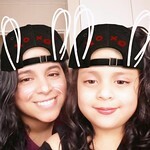 The only change that I made was that I stitched both girls with dark hair . El viernes terminé de bordar este proyecto ; me tomó 4 noches para poder finarlizarlo. Este diseño es un gráfico gratis que encontre en una página francesa, Anne le petit croix. Es super fácil de bordar y utilicé os colores que indicaba el diseñador, el único cambio que realicé fue que a una de las niñas que originalmente era rubia la bordé con cabello oscuro . ETA. 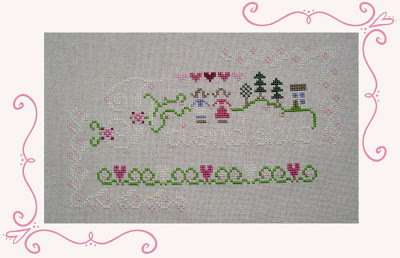 Cheryl: This design is a freebie you can download in the Cyberstitchers website, the designer is Barbara Ana. 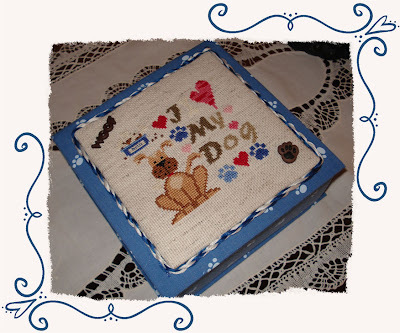 Yesterday I made a little box with a design I'd stitched a couple of weeks ago. It's the first time I do this and definitively not the last...I made a few mistakes here and there but well I will try not to make them again next time. Ayer hice una cajita utilizando un bordado que había hecho hace un par de semanas. Es la primera vez que hago una, tiene algunos defectillos pero bueno trataré de no cometerlos en mis proximas cajitas, porque definitivamente hare más! This week I received my JABC Button Pack, this month theme was off course Valentines. For three months now I've been subscribed to JABC Button Pack on DSL website, so far I've not been disappointed on the buttons they've put together each month. Esta semana recibí mi envio mensual de DSL, estoy suscrita a su club de botones...el tema del mes era San Valentin. Ya llevo tres meses inscrita en este club y hasta ahora no me han defraudado sus envios..me encantan todos los botones que he recibido. Have you ever been to a stitching retreat? A couple of weeks ago I started this design, called "Friendship". I had worked on it for 2 hours when I suddenly noticed I had made a few mistakes ... I was so upset I *frogged* it all and put it away . This weekend I picked it up again and this is my progress so far...not bad, right ?? Carol, my sister, doesn't like it very much she says it's not her style...we might be identical twins but we don't necessarily like the same things...and prove of that is that I LOVE it ! Hace unas semanas comencé este bordado llamado Friendship (Amistad), ya había trabajado en él un par de horas cuando noté que me había equivocado...no una sino varias veces!!! Desarmé todo lo que había avanzado y lo guarde. El fin de semana decidí retomarlo nuevamente y este es mi avancé. A Carol, mi hermana, no le gusta no es su estilo...lo que demuestra que a pesar de que somos gemelas identicas no necesariamente tenemos los mismos gustos pues a mi en encanta!! 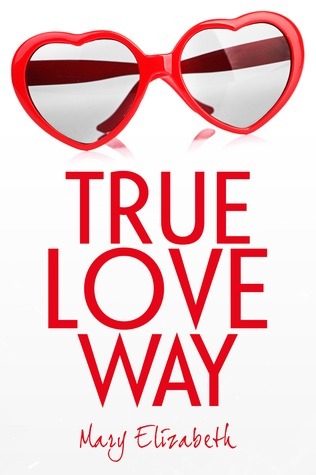 Thanks a lot for all the comments...I love to read them!! Hace un par de semanas escribí que iba a trabajar en este proyecto 2 veces a la semana, pues a la semana siguiente no lo cumplí jejej...y recien esta semana lo he retomado. Me esta encantando trabajar en él pero creo que va a ser toda una pesadilla al final con todo el pespunte y nudos franceses que voy a tener que hacer para terminarlo.